The myth that baseball was invented by Abner Doubleday has been widely spread since 1907 and even today is sometimes stated by such people as former Major League Baseball commissioner Bud Selig. For instance, in 2010 he stated: “As a student of history, I know there is a great debate whether Abner Doubleday or Alexander Cartwright really founded the game of Baseball. From all of the historians which I have spoken with, I really believe that Abner Doubleday is the ‘Father of Baseball’. I know there are some historians who would dispute this though.” In truth, all historians who have studied the matter would dispute this. Why? 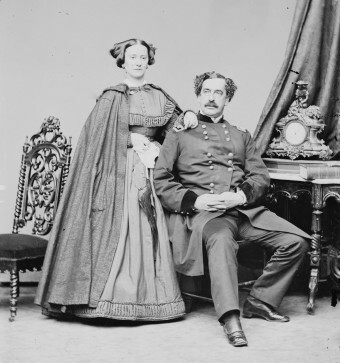 The fact of the matter is there is no record- not one- of Civil War General Abner Doubleday having anything to do with baseball. This includes Doubleday himself never mentioning it in the many letters and journals he wrote in his lifetime. Somewhat humorously, the only real reference to Doubleday concerning sports appeared in an obituary written about him in 1893, which stated he was a man “who did not care for outdoor sports”. So what happened in 1907 to make people start thinking Abner Doubleday invented baseball? In 1905, Albert Spalding put together a panel called The Mills Commission to investigate the origin of baseball. This was in response to an ongoing argument he’d been having with Henry Chadwick about the origin of baseball. Chadwick claimed, correctly, that baseball evolved from a variety of stick ball games from Europe, primarily the game of “rounders” Chadwick had played as a boy in England. Spalding claimed baseball was invented free of such influences and was a wholly American-made sport. The panel Spalding put together did not include any historians, but rather was comprised of former National League presidents A. G. Mills, Nick Young, and Morgan Bulkeley; former Washington club president Arthur Gorman; two former players and now sporting goods businessman George Wright and Alfred Reach; and finally the Amateur Athletic Union president James E. Sullivan. Initially this group had very little luck in discovering a definitive origin of baseball, though by all accounts they didn’t try very hard to actually do any research. They seemed to simply rely on placing advertisements, requesting that if anyone knew anything about the origin of baseball, they should respond. Finally, in July of 1907, Spalding sent a letter to the Commission outlining an account of the origin of baseball he’d learned from 71 year old Abner Graves, a mining engineer, who incidentally shortly after giving this account wound up in an insane asylum, where he spent the rest of his life. According to Spalding, who embellished Graves’ statement, on a fateful day in 1839, the man who would later become a Civil War hero, supposedly interrupted a game of marbles and taught a group of boys to play a sport he’d just invented. Based solely on this story and without bothering to check into its accuracy, The Mills Commission decided that baseball had been invented by General Abner Doubleday in Cooperstown, New York in 1839. He then recounted the rules Doubleday supposedly laid down which were actually more or less just rules for a version of Town Ball. Town Ball was a game commonly played by school boys throughout the U.S. with the exact rules varying based on where you played it. It, in turn, evolved from the English game “rounders”. Spalding and the Commission embellished Graves’ story to make it sound more definitive. It is possible Abner Doubleday really did play a game of Town Ball in the late 1830s in Cooperstown, as this was a common game and there would have been nothing unique about a young man playing a version of it, but he certainly didn’t do it in 1839. Abner Doubleday wasn’t in Cooperstown in 1839, he was at West Point at the time, which is about 150 miles away and West Point has no records of him taking leave, including him remaining at the school throughout that summer. Given Abner Graves was four years old when Doubleday left Cooperstown for West Point, it’s not clear how he learned of the details of this supposed first game. Close friends of Doubleday, which included A.G. Mills who was on the Commission, claimed that not only could they not remember a single instance of Doubleday ever claiming to have had anything to do with baseball, none of them even remember him even mentioning the sport at all, despite its spreading popularity towards the end of Doubleday’s life. Doubleday died in 1893, so he couldn’t be asked directly. Given how well documented his life was, particularly through his journals and letters, it seems curious that he never mentioned it in word or in text, if we’re assuming he invented it. I submit to you, gentlemen, that if our search had been for a typical American village, a village that could best stand as a counterpart of all villages where baseball might have been originated and developed — Cooperstown would best fill the bill. Friend Crane, I thank you for your support of my arguments in the controversy between Al Spalding and myself as to the origin of the National Game. Spalding must realize that the rounder argument overwhelms the ridiculous fraud of Mr. Graves and the findings of the commission which are inherently flawed. It seems “Young Albert” [Spalding] is overzealous in his patriotism to a fault. Indeed, baseball is a truly American Game – but it evolved – and I am old enough to bear witness to this like my old friends Mr. Peck and Mr. Curry. Again many thanks for your letter. It is promising to see others interested in the truth. As Chadwick thought, the truth of the matter is that baseball wasn’t “invented” at any particular time nor by any particular group. It was more of an evolution of a variety of games played with a ball and a stick, something humans have apparently been doing since there were sticks and rocks. Recent manifestations of these stick/ball games that predate baseball include one such game played in 1796 in England called “Englische Base-ball” that was played with two teams where “the batter has three attempts to hit the ball while at the home plate.” Each side was given just one out. Another popular game in England, mentioned by Chadwick, was known as “rounders”, which is typically attributed to being a more direct ancestor of baseball. In rounders, the rules were slightly different depending on where you played, but basically it was a stick and ball game, played on a diamond, with bases. The batter would attempt to hit the ball into play and run to a base before being tagged out (which included being hit by the ball if someone threw it at you). This gave rise to “Town Ball” in the U.S., of which there were many varieties. Further, if baseball can be said to have been invented anywhere, it was not in the pastures of small towns, like Cooperstown, but in cities, by both school boys and adults alike. According to future Knickerbocker William Wheaton, one such adult group, just looking for a fun way to get some exercise, formed a Town Ball team called “The Gothams” in 1837. A few years later, this group grew so large that they had to split, with part of the group forming the Knickerbockers, named after the Knickerbocker Fire Engine Company. The Knickerbockers then adapted the rules of various stick ball sports to make one that suited their particular purpose to get exercise in a fun way with little chance of injury (so, for instance, they got rid of the somewhat common rule that you could throw a ball at someone and if it hit him, he’d be out). The rules for this adapted game were codified in Hoboken, New Jersey on the Elysian Fields, with the first official “base ball” club being the New York Knickerbockers, led by Alexander Cartwright (bookseller and volunteer fire fighter). There were many such similar clubs around at the time, playing extremely similar games, but it is through the Knickerbockers’ efforts that the modern game was popularized. They developed the “20 rules and regulations of the Knickerbocker baseball club”, which were eventually adopted by other clubs and as the official rules of this “new” sport. The first recorded baseball game was held on June 19, 1846. The game was played on the Elysian Fields between the New York Nine and the Knickerbockers, at the time the only two clubs playing by this exact set of rules. The Knickerbockers lost 23-1. I chanced to go through Elysian Fields during the progress of a contest between the noted Eagle and Gotham Clubs. The game was being sharply played on both sides, and I watched it with deeper interest than any previous ball match between clubs I had seen. It was not long before I was struck with the idea that base ball was just the game for a national sport for Americans. I don’t think you could have had the rise of baseball without gambling. It was not worthy of press coverage. What made baseball seem important was when gamblers figured out a way to spur interest in it. … In the beginning, there were people who turned their noses up at gambling but they recognized the necessity of it. You would not have had a box score. You would not have had an assessment of individual skills. You would not have had one player of skill moving to another club if there were not gambling in it. By the 1870s, because of the fact that fenced off stadiums where teams could collect money were being built, the Elysian Fields dwindled in popularity as the home field for various club’s matches. The last official professional baseball game to be played in the Elysian Fields was in 1873. Today, the place where the field was is mostly covered in houses, with a small area of the field preserved by Hudson Street and Frank Sinatra Drive on one corner and Castle Point Terrace and 11th and Washington Street on the other. Graves’ account of Doubleday’s baseball included 11 men on each team, four outfielders, five infielders, a pitcher, and a catcher. Hitters did not use round bats, but rather, flat, like in cricket. Abner Doubleday’s grandfather, also named Abner, fought in the American Revolution, including being a mounted messenger to George Washington at the age of 14. Doubleday’s father fought in the War of 1812. Despite Abner Doubleday having had nothing to do with baseball’s origin, the Baseball Hall of Fame still displays an oil painting of Doubleday. Two blocks from the Baseball Hall of Fame in Cooperstown, there is also a “Doubleday Field” which until 2008 hosted the “Hall of Fame Game” during the Hall of Fame induction weekend. From 2009 through today, the field now hosts the “Hall of Fame Classic”, featuring various Hall of Famers and retired MLB players, who play an exhibition game there on Father’s Day weekend. In response to a letter Bud Selig received on the origin of baseball, he wrote the following (October 18, 2010): “As a student of history, I know there is a great debate whether Abner Doubleday or Alexander Cartwright really founded the game of Baseball. From all of the historians which I have spoken with, I really believe that Abner Doubleday is the ‘Father of Baseball’. I know there are some historians who would dispute this though.” Apparently he should talk to Major League Baseball’s official historian, John Thorn who would be one of those historians that would argue this point. Congress officially declared in 1953 that Alexander Cartwright invented baseball. This is going a little far, as there was nothing truly original about the game Cartwright and his Knickerbockers came up with. It was merely a very slight adaptation on existing games. Further, Cartwright didn’t come up with the “20 rules” himself. It was a group effort by the Knickerbockers. The baseball “diamond” is really just a square, being 90 feet from each base to each base. Of course, “diamond” rolls of the tongue a little sweeter and isn’t technically inaccurate, which is presumably why we call it that, instead of “baseball square”. Unlike the height of a pitching mound, the basic layout of the baseball diamond has seen few changes since its originally accepted design in the 1840s. The distance between the bases has remained constant at 90 feet, which continually proves to be the ideal distance without giving favor to either the batter/runner or the throwing speed of an infielder’s arm. Well… unless your name is Ichiro. Baseball was significantly popularized due to the Civil War with soldiers on both side playing it and spreading it to soldiers elsewhere they encountered. Actually the first recorded Baseball game was in 1838 in Beachville, Ontario, Canada. Your article is very interesting but it has couple of errors. Abner Graves was 91, not 71 and Mr. Graves letter states that Abner Doubleday and his friends played “ball” on his farm. Also, in examing the letter, the date could be read as 1937, at which time Abner was in Cooperstown. Also, the book “Home as Found” by Cooper states the “ball” was played on Cooper’s lawn in 1838. You are correct that none of Doubleday’s writings discuss baseball, but as a civil engineer, he could have laid out the diamond. Interesting subject, but my family is always asked out Abner and Baseball. Abner was my Great Uncle, his brother Ulysses my Great Grand Father. Pittsfield Massachusetts has a document from 1791 that basically saints don’t play baseball or any other games near the meeting hall.